Yesterday people hooked to TWITTER had much to laugh and talk about. Of course that is what Twitter is all about beside the norm thus people complaining about their daily lives. We all know Sarkodie graced Ghanaians with another achievement that is being the first Ghanaian on the BET Hip Hop awards Cypher. 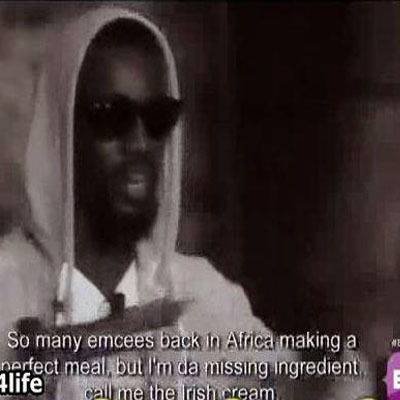 Sarkodie’s line in the cypher ‘….. I’m the missing ingredient in a perfect meal, Call me the Irish Cream‘ didn’t go well for Ghanaians as they probably think Irish Cream is not an ingredient. Sarkodie got lashed last night on twitter for his ‘GBAA’. I’m shocked people are surprised though as most of Sarkodie’s lines doesn’t make sense but rather funny. I’m not here to criticize ‘dude’s’ rap. Of course he’s HOT cake right now and he’s got the ‘Midas touch’, thus everything he touch turns to Gold. People on various Social media has taken advantage of the situation to laugh at our legend, Sarkodie took the time to explain himself on his twitter account but all to death ear. Check out the photos of what people are doing with #IrishCream joke. People are also complaining that his rap on the Cypher was weak and was quite mild for someone like Sarkodie. Of course people are expecting big from the rapperholic on a big stage so to show people that we (Ghanaians) also got something to boast about.